The Teeny Tip-Taper line is different than our other T-Series lines. The first 10 feet of the 22 foot sinking section has Approx. greater density and drops quickly. 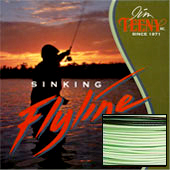 You can feel the tip section sinking faster and offers excellent line control, easy to handle and roll cast.